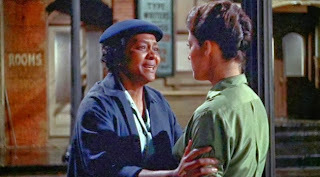 Among the most powerful acting performances I've seen this past year were those of Juanita Moore and Susan Kohner in Douglas Sirk's Imitation of Life (which I had watched for the first time last summer). 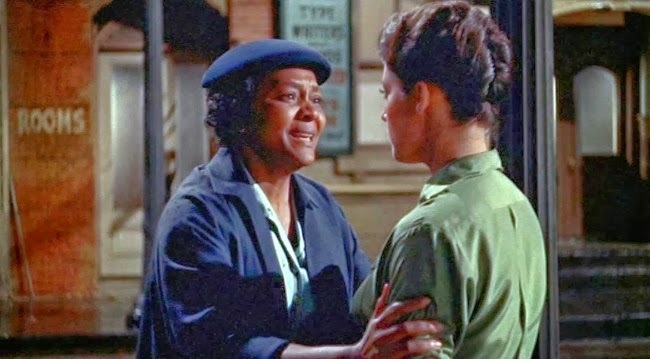 Ms. Moore, who passed away today at the age of 99, was the fifth African American performer to be nominated for an Academy Award, for her unforgettable work in Sirk's 1959 melodrama. Imitation of Life, adapted from Fannie Hurst's novel and previously filmed in 1934, features Lana Turner and Juanita Moore as two women who share a home, each with two young daughters to raise. This film was a strong indictment of racial segregation in its fascinating story of two single mothers of different races who live together. Ms. Moore's role as a housekeeper largely remains unchanged while her housemate, an aspiring actress, rises in stature, however, we've seen that she is truly the backbone in this dynamic. They rely upon each other for economic and domestic reasons, yet there is also a deep friendship. Although Lana Turner is first-billed, the film is stolen by Juanita Moore and Susan Kohner, as her daughter who passes for white and renounces her black heritage. Their scenes together are unbearably moving, with Ms. Kohner's fiery selfishness balanced by Juanita Moore's heartbreak of betrayal. Although Juanita Moore was quite active before and after Imitation of Life, she is understandably best remembered for this landmark role.